The only winter, spring and summer solider that doesn’t need a vest is Chuck Norris. Especially a bullet proof vest. For the rest of us, and more so, for those of us fashionistas, the vest has seen quite the surge recently. Men don it more and more. From three piece suits, to casual wear, and the standard attire for a black tie event, the vest has truly seen a resurgence in recent years. But given that it’s still relatively foreign to many of us, how exactly do we wear one? A well fitted vest should be long enough to cover the man’s waist in the front, with no dress shirt showing between the waist and the belt. The back can and often is cut slightly higher. Be sure to wear a fitted shirt or have your shirt appropriately tucked in, so as to avoid your shirt bunching up around your waist at the back! 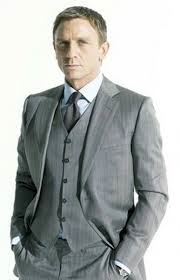 Just as is the case with a suit, your vest should fit snugly around your shoulders. If you are wearing a three piece suit, the V-shape of your vest should be narrow enough so that the suit doesn’t hide it entirely. When buttoning up your vest, leave the bottom button undone. Given that the front of your waistcoat is long, it shouldn’t expose dress shirt at the front. Why the bottom button is left undone is probably as much functional as it is tradition. With greater flexibility to move around with the bottom button undone, and with the fact that one would be respecting tradition, it is probably prudent to continue this trend than to buck it. The most notable example of when one can strut a vest is at a Black Tie event. 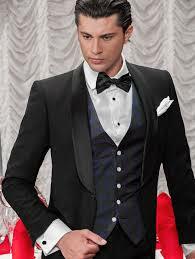 Vests for tuxedos are more formal, and hence come with lapels that are made from the same fabric as the tuxedo lapels (usually satin or grosgrain). Black Tie waist coats are generally cut lower so as to expose more of your tuxedo dress shirt, which are generally more sophisticated with pleats running down the middle. Matching black vests for your tuxedo are generally the best option. The WaistCoat for a Black Tie Event is typically cut lower so as to expose more dress shirt, and allows for a narrower ‘V’ so as to expose the vest and not be hidden by the tuxedo jacket. Vests combined with a suit can turn your standard business attire into something significantly more fashionable and sophisticated. As is the case with a tuxedo, your vests should generally match your suits and be worn with a necktie. A Three Piece Suit looks best with a matching vest. Also note how the vest is cut higher than a tuxedo vest, hence exposing less of your shirt. 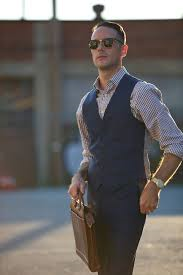 A vest worn with a pair of slacks or jeans can also look extremely sharp. Just be sure to wear it with a long-sleeved shirt. Avoid the T-Shirt at all costs! Unless, your Van Damme – then you can just wear Spandex.